Well, I must confess I know next to nothing about the character whose action figure I’m reviewing today. 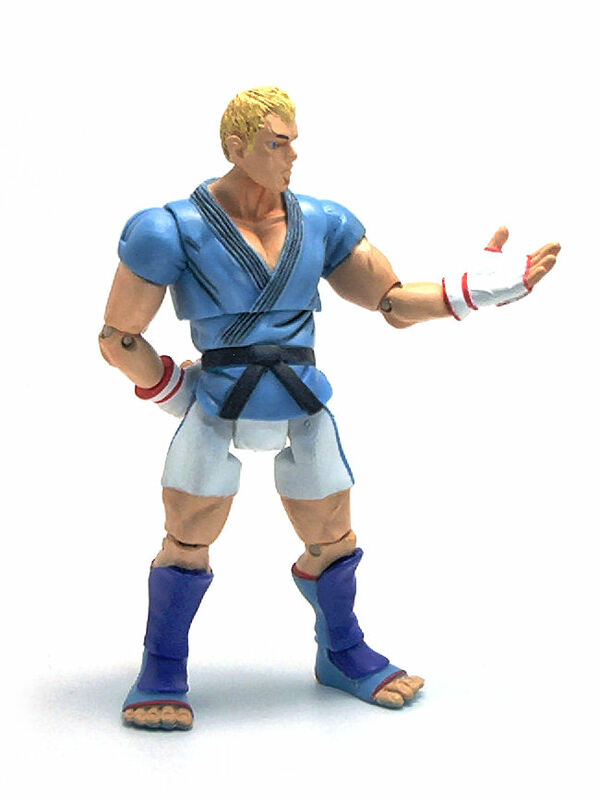 After a quick dive into Wikipedia, it seems Abel made his first appearance in the game Super Street Fighter IV, and he is supposed to be the result of biological experimentation, in the vein of the Weapon X /Grand Army of the Republic programs. 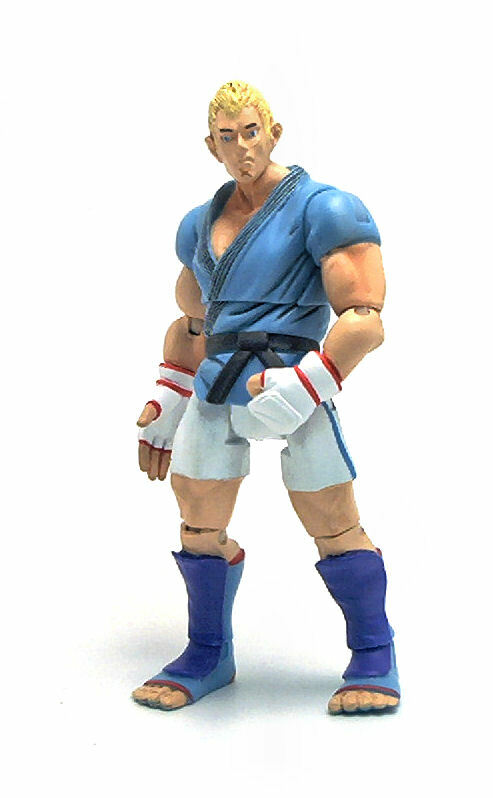 It is hinted in the game that he was either a prototype for Seth (the top in-game Boss) or grown as a replacement body for M. Bison, but the truth is left intentionally ambiguous. 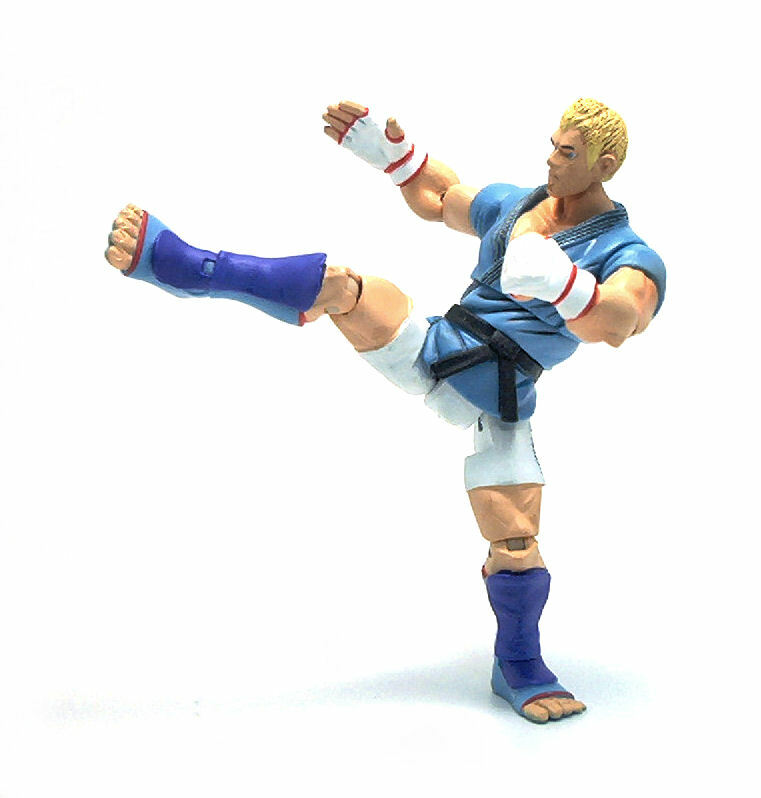 Whatever the case, Jazwares deemed the character fit to be released as part of their Street Fighter 4-inch action figure line and the results are mostly positive. Abel is sculpted in a distinct animated style incorporating a good amount of details. 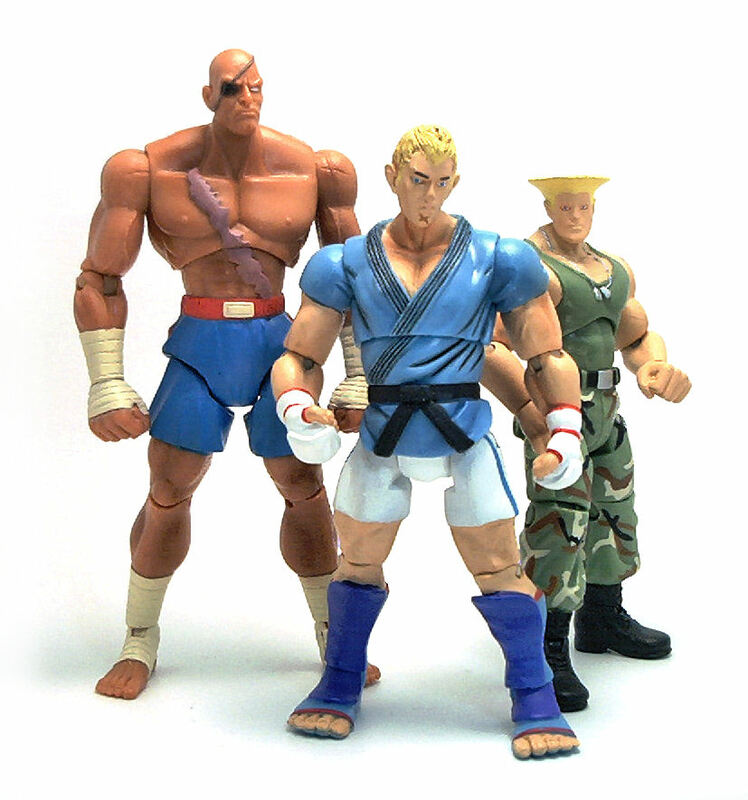 Right off the bat, Abel is bulky, not as tall as Sagat, but almost as wide and very muscular. On the face and limbs Abel has a number of scars sculpted on, but sadly the paintjob doesn’t take advantage of the extra work. 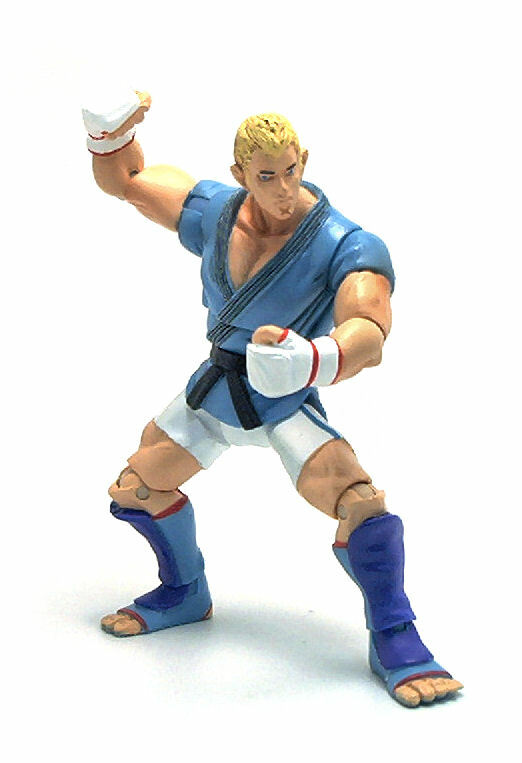 Abel wears kickboxing shorts, a short-sleeved tunic closed by a black belt and martial arts protective gear for shin and hands. The clothes are well sculpted with creases and wrinkles where appropriate and even the gauntlets and shin guards have a puffy, padded look. Abel incorporates an extra joint, the swivel at the waist. This may not seem like a big deal but it actually allows for better looking poses by aligning the trim on the tunic even when twisting the torso. The rest of the joints are pretty standard and work very well. One advantage of the animated style proportions is that the enlarged contact area on the feet provides great stability and the larger contact areas in the joints generate enough friction to hold the more dynamic stances unassisted. The paintjob on Abel is gener ally good, especially considering that this figure is molded entirely in light blue plastic, of all colors, so fairly evident that these are mass-market items. The the rest of the colors in the scheme are added on top on one another, which results in fairly thick coats of paint. The coat of paint over the skin appears to be the thick enough to obscure small details like the sculpted scars I mentioned earlier and which appear to be nothing more than bulging veins on limbs and face. It is possible to see a cross-shaped scar on Abel’s chin, picked out in darker flesh tone, but other similarly sized scars, like one across his cheekbone, are left unpainted. In contrast, the uniform received probably more paint than it needed to. 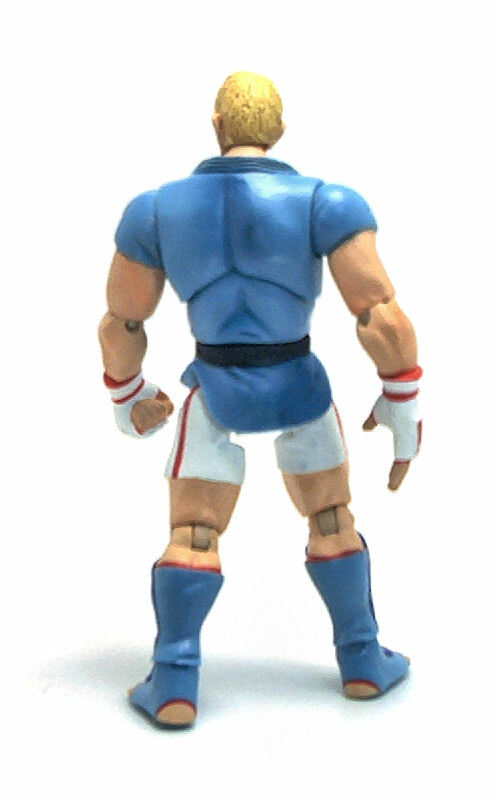 The shorts and the gloves on both sets of hands are painted white, with red and blue trim neatly applied. The tunic received a shading wash on the deeper folds and the collar, but also some airbrushing was applied to enhance the volumes. The shin guards are simply painted in solid purple. 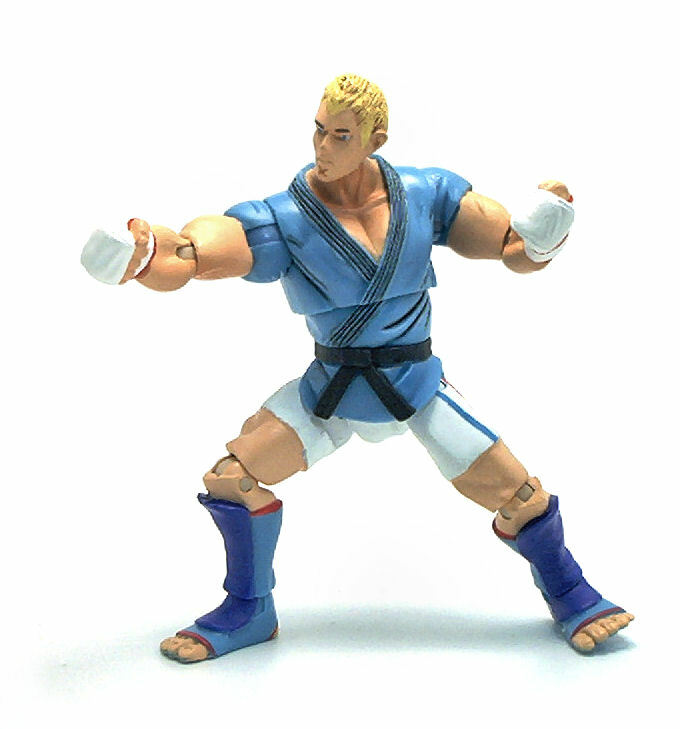 Abel comes with an extra set of hands, the default has them balled into fists and the alternate set has open palms. Both sets are easy to remove, but I found the alternate set on my figure to be harder to put back in because the material is a bit too pliable and the connecting pegs are (possibly) slightly thicker. Even though the issue with the unpainted scars was odd, my impressions of Abel are very favorable, to the point I would actually enjoy going back and touching up the paintjob myself.